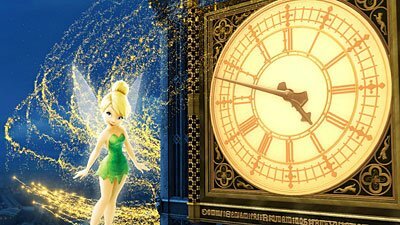 The Speaking Clock is to ring out in the sweet tones of Tinker Bell when the clocks go back this weekend*. The famous fairy will take over the duties of Britain’s famous time machine at the end of British Summer Time. For years the famous fairy has not uttered a word in her films, only made a jingle noise. But now for three months she will be heard by callers when they dail 123 to hear the BT Speaking Clock. The traditional time pips are also being replaced by bells as part of a sponsorship deal with Disney. Tinker Bell first came to life in JM Barrie’s 1904 play, which developed into his children’s novel and the 1953 Peter Pan Disney animation. The ‘real’ voice for Tinker Bell is being supplied by actress Mae Whitman, who is also voicing the fairy’s first speaking part in the film Tinker Bell due out in November. *British Summer Time ends on Sunday 26 October at 02:00 BST (01:00 GMT) when clocks will go back one hour.